One of things I love most about fall in Colorado is the diversity in climate, weather, and all of the variety of activities available at this time of the year. Last week my step-daughter, Michelle, and her two children, Elizabeth and Sean, traveled from Corpus Christi, Texas to visit us here in Colorado. 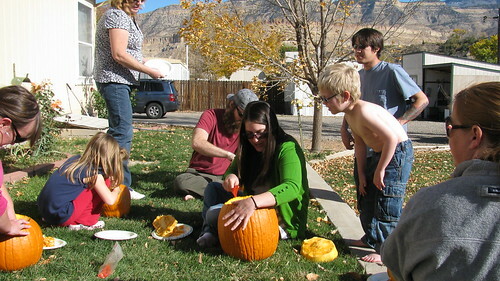 The plans were to “see snow falling” in Aspen and to carve pumpkins later on at their cousin’s place in Palisade. I was also hoping that they might be able to get a glimpse of one of Aspen’s infamous bears. Although Michelle grew up here (from age 13), Elizabeth and Sean had never seen snow. They were hoping to see some while they were here, but we tried to keep expectations low – after all, it was still October. As luck would have it, their short visit coincided with our first “real” snowstorm of the year, and the kids got their wish! After a visit to the Yellow Brick for the obligatory “grandkids’ playground mastering”, we returned home just before the snow began to fall. 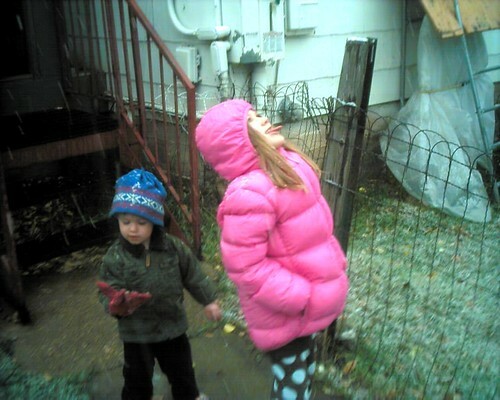 Shortly thereafter, dressed in hat and gloves lovingly loaned to them by grandma, the kids ran around the yard, valiantly attempting to catch snowflakes on their tongues. I think they managed to get more in their eyes than on their tongues, but hey, it does take some practice to get it right. Once the novelty of the cold weather began to wear off we went inside to dry off, warm up, get some dinner and prepare for… “bear patrol”. We have routinely seen bears roaming around our neighborhood this fall and were hoping we could spot some somewhere nearby (from the car, of course) as we cruised around the west end of Aspen. Unfortunately, the bears were shy (or had heard we were coming) and we did not spot any that evening. We even popped in on some of their favorite disreputable stomping grounds, like alleys, dumpster areas, and other known Aspen bear hangouts, but to no avail. 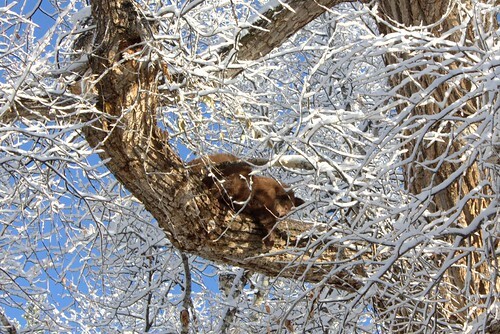 Luckily, we did finally spot a little sleepy one hanging out in a tree by the Community Church the next morning. 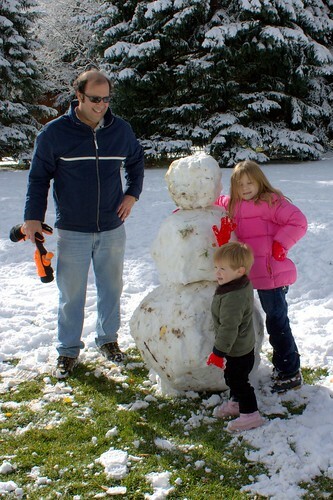 After a quick, surprisingly successful trip to the Thrift Shop in Aspen for some gloves and snow boots (didn’t want the first snow experience to be an overly frigid one), we made our way to Paepke Park so that Elizabeth and Sean could construct their first snowman. Of course a lot of leaves and mud still lay just beneath the relatively thin layer of snow, but there was enough of the white stuff to make a reasonably-sized (albeit dirty) snowman. Michelle and I affectionately (and secretly, of course) nicknamed it the “Snowbum”, but the kids didn’t know any better and didn’t seem to notice that their snowman was not “pristine”. Later that day, they made their way 100 miles down the road to the sunny, warm confines of Palisade, Colorado to visit their cousins. Once in Palisade, the plan was to pick pumpkins at a local pumpkin patch on Friday and carve the heck out them on Saturday. I missed the Friday festivities, but was able to rejoin them on Saturday for the pumpkin hacking extravaganza (unfortunately, I didn’t get down there in time for “Truck ‘n Treat” earlier in the day). As usual, the weather in Palisade was quite different from that in the Aspen high country and we were able to hang out outside in the pleasant 70ish degree, sunny weather while we all attempted to display our artistic prowess. Cleaning out the innards of the pumpkins was a daunting, unpleasant task, especially for the little ones, but it created much amusement among the adults. 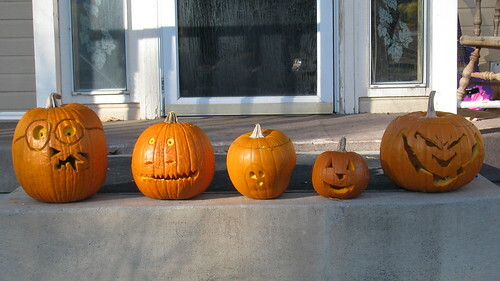 Ultimately, curiosity and creativity won out over “yuck” as evidenced by “Jack-O’-Lantern Row”. Before the afternoon was over we even got a chance to do a little mock sword fighting to burn up some youthful (for some) energy in the large lawn. We capped off the fun-filled afternoon with some highly anticipated “normally” priced Grand Junction shopping before we returned to the more wintry climate of Aspen. Since we’ve been back though, the weather here has been dry, sunny, and quite a bit warmer (for now). 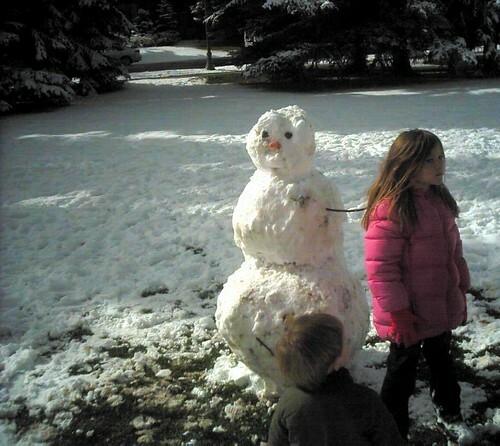 Although “Cruddy” the Snowbum has melted away into snowman heaven, our memories and photos of a fun-filled family weekend of snowmen, bears, and pumpkins will last a lifetime. Aspen Events - Balloons, Fall Colors and Rugby - Oh My!